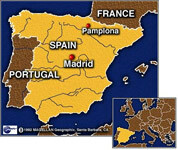 Navarre’s greatest claim to fame is that its capital Pamplona is host to one o f the world’s best known festivals. The San Fermin Fiesta entices dare devils from across the globe to risk life and limb in the annual running of the bulls through the streets of the city. It’s an event which fired the imagination of the famous author Ernest Hemingway who lost his heart to this little known corner of Spain and described it lovingly in bestsellers such as For Whom the Bell Tolls and The Sun also Rises. The history of the ancient kingdom of Navarre always has been marked by its border situation with France, Castile, Aragon and Baskland. Its beautiful towns, like Artajona which is surrounded by medieval walls, Estella, Olite, formerly seat of Navarre's kings, Tudela and Roncesvalles are definitely worth a visit. Navarre cannot be fully understood without considering the impact of the Pilgrim's Way to Santiago (also called St James Way), which has left a wealth of churches, monasteries and hospitals that initially attended to pilgrims following the route. It was initially promoted by King Sancho III 'el Mayor' in the 11th century. Navarre is divided in three sectors: the mountain range of the Pyrenees in the north, with exceptional landscapes as the Baztan valley; La Riviera in the south, a plain land with small lagoons and the fertile valley of Ebro river, and, in between, la Zona Media, with impressive landscapes and canyons as Hoces de Lumbier and Arbayun. Navarre is a land of deep-rooted traditions that reflect the plural nature of its customs. 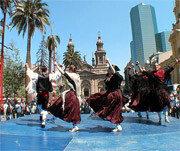 Music, dance and gastronomy are the highlights of fiestas in the towns and villages. Pagan rites exist alongside religious traditions throughout the four seasons. In each season of the year Navarre 'dresses up' to show all its splendor. Any time of the year is a surprise for the senses and a unique opportunity to get away from it all. Nature shakes off the winter and the spring wakens up the senses. Navarre is covered in green, the leaves come out on the beech and oak trees, the meadows are a patchwork of lively colours, and flowers decorate the facades of the farmhouses. At the table, it is a time of menestra, salmon, artichokes and asparagus, some of the most representative dishes in the gastronomy of Navarre. May is filled with gastronomic competitions and tasting sessions, among other activities. In summer Navarre explodes in red and white. 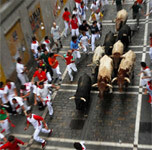 In early July the Sanfermines take place and Pamplona overflows with fun. The summer is a time to enjoy nature, the long sunny days, and the pleasant climate of the Pyrenees. It is a time to dwell on a café terrace and taste the delightful pinchos (tapas) in the bars of Pamplona, it’s a time to basically discover monumental Navarre and its history. At the table, it is time for dishes from the market gardens of La Ribera. Many vegetables are present in Navarrese cuisine in the summer season: red piquillo peppers, tomatoes, cucumbers, courgettes or green beans. The star dish is cordero a la estaca (literally, lamb on a stake). In autumn the landscape is flooded with green, ochre, golden and reddish colors. The Pyrenees of Navarre generally transform themselves into a symphony of colors set to the bellowing of the deer at the start of the season. Autumn also means culture. There are concerts and theatre plays in the select programme of the BALUARTE or the Teatro Gayarre, and also the Escuela Navarra de Teatro (Theatre School of Navarre). These are the months of the hunting season. It is also a time of artichokes and borage, typical vegetables from La Ribera, and the red piquillo peppers. In winter the countryside goes to sleep and a white mantle covers the Pyrenees. 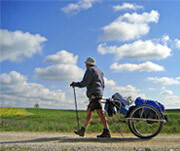 It is a time to enjoy cross-country skiing and snow racket expeditions in the Salazar and Roncal valleys. It is also a time, however, to enjoy still-sunny days and religious and pagan traditions alternate. In winter there is an extensive range of cultural activities in the BALUARTE or the Teatro Gayarre. At the table, red beans, meats, cheeses, wine and liqueurs are the highlights. The cold weather is ideal for trying migas de pastor (literally, 'shepherds' breadcrumbs') that are typical of Ujué, pochas (succulent white beans) from Sangüesa or gorrín (suckling pig) from Tierra Estella. At Christmas, cardo (chard) is usually served at the table. Navarre is an ideal place to hold national and international congresses and conventions. It has the latest infrastructures for holding any kind of event, with over one hundred conference rooms in the city's hotels, institutions and universities. The capital of Navarre stands out for its prestigious universities and hospitals and a strong business fabric, plus a comprehensive range of hotel and communications infrastructures. Pamplona-Noáin national airport, the international airports of Bilbao, Vitoria and Biarritz (just over an hour away by road), expressways, motorways and rail links (particularly the high-speed train to Madrid) make it easy to travel from Pamplona to the rest of Spain and Europe. Navarre is also a popular venue for incentive travel and business meetings. Combining work with cultural visits or open-air activities could be an unforgettable experience, in a region characterized by a wide range of hotels and high-quality restaurants and the short distances to interesting tourist spots. Navarre is a Land of Traditions…and Fiestas: 'The Fiesta of all fiestas' takes place in Pamplona. Furthermore, a whole range of celebrations take place over Navarre throughout the year. The fiestas of the north fill the streets with dances and exhibitions of rural sports, in contrast with those of the south, where steers chase the youngsters through the streets and red and white give the festivities their distinctive color. Fiestas are celebrations that invite you to participate in the customs of the Kingdom of Navarre. 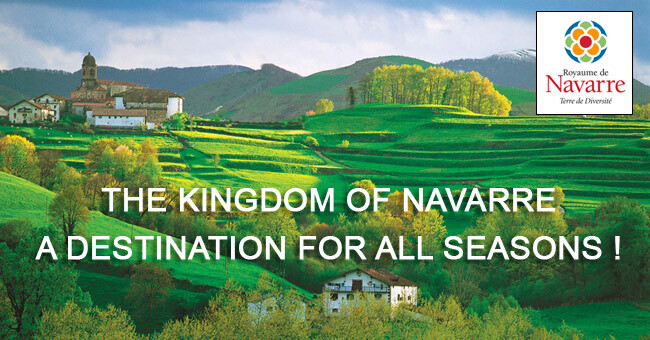 Let yourself be seduced by the Kingdom of Navarre!